Haarlem, Teyler Foundation, no. A x 80. Pen and brown ink, brown wash, black and red chalks, heightened with white, on paper tinted with pink wash, 27.9 x 19.3. 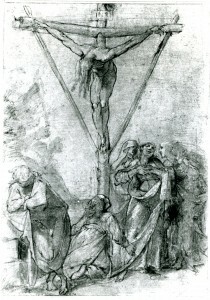 Inscribed in pencil in the upper left corner: 25; the upper left corner of the verso inscribed in pencil: 24. PROVENANCE (from Christina Queen of Sweden, 1966): Sandrart. Queen Christina of Sweden. Azzolino, Duke Livio Odescalchi. Triomphe du Maniérisme, 1955, 139, no. 245, Pl. 42, as Rosso, probably before 1516. Theodore Rousseau, Jr., “The Triumph of Mannerism?,” Art News, LIV, 5, September, 1955, 21, Fig., as Rosso. Barocchi, 1958, 235-236, as Rosso. Berenson, 1961, no. 2442C, as Rosso. Carroll, 1964 (1976), II, Bk. 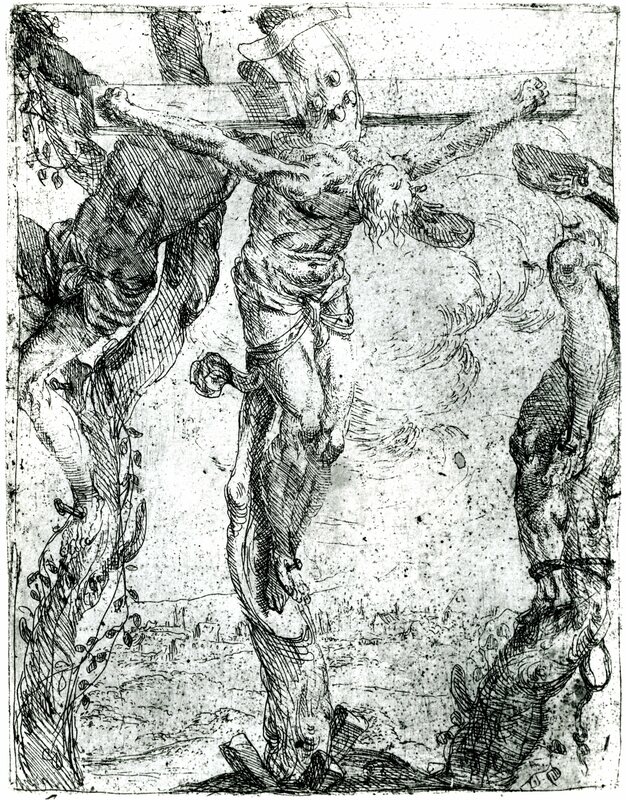 II, 489-490, F. 33, Bk. III, Fig. 185, as by Pellegrino Tibaldi, around 1549. Hauser, 1965, II, Pl. 68, as Rosso (but wrongly as in the Uffizi). J.Q. 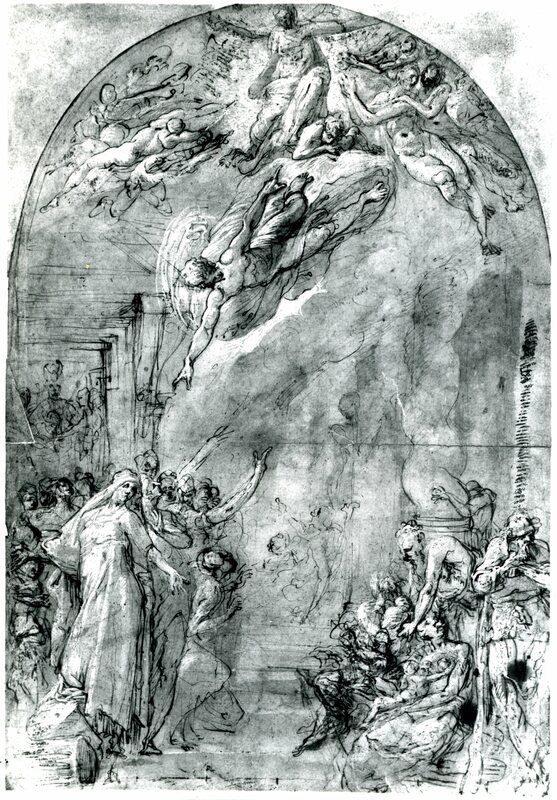 van Regteren Altena, Les Dessins italiens de la Reine Christine de Suède, Analecta Reginensia II, Stockholm, 1966, 97, as Rosso. Christina Queen of Sweden, exh. cat., Nationalmuseum, Stockholm, 1966, 452, 1101, as Rosso. 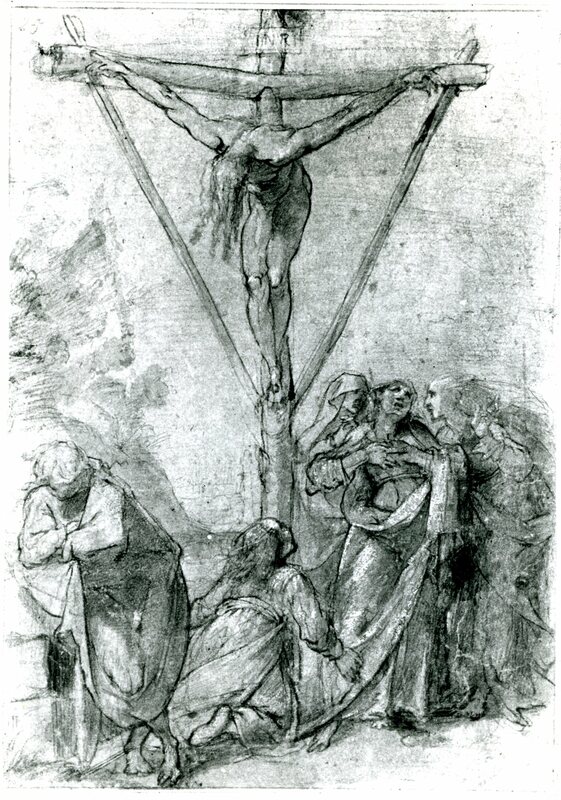 Leo Steinberg kindly pointed out to me that the figure of Christ appears in the etching Christ Crucified Between Two Thieves by C P (Bartsch, XIX, 1821, 183-184, 1),3 a monogram identified at the Albertina as that of the Bolognese Giovanni Pietro Possenti (Fig.Crucifixion). 1 Popham and Wilde, 1949, 337, no. 947, Pl. 109. For the correct subject and an illustration of the picture for which the drawing is a study, see Briganti, 1945, 119, Fig. 137. 2 Briganti, 1945, 120, Fig. 106. 3 Vienna, Albertina, It.III.20, p.9 top; 15.9 x 12.2.